We offers you the opportunity to experience yoga lessons in a unique environment. Achieve calmness and serenity through the fluid movement of water and nature’s surroundings, while at the same time you take advantage of your core’s underlying power. Imagine nature being your studio and the board your mat. 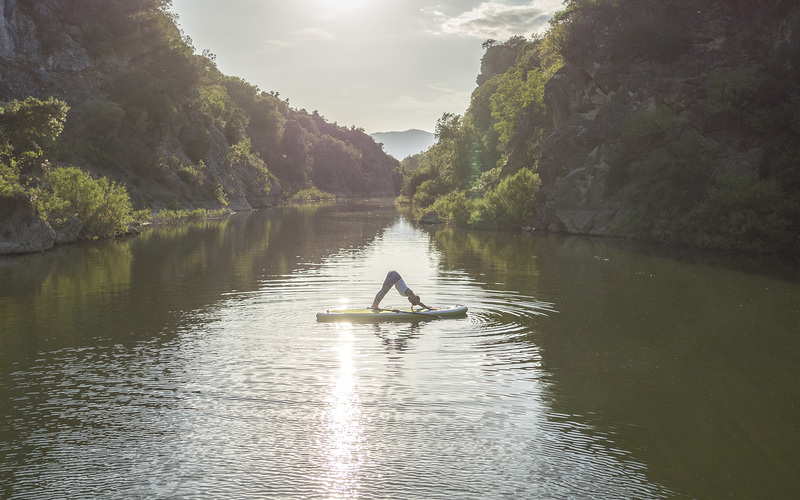 That’s Paddleboard Yoga! Why settle for a replica of natural surroundings when you can have the real thing? Outdoor classes add a different dimension to one’s practice and pare yoga down to its original link with nature. Our goal is to offer you a reinvigorating experience to be remembered forever. The gentle sound of water lapping while on a paddleboard will help you relax and combat stress, fatigue, and pain. Breathing fresh air, soaking up vitamin D and enjoying the natural landscape of the Sardinian sea, beats just about any gym or studio out there. There is absolutely no need for prior experience of Yoga or Stand up Paddle. 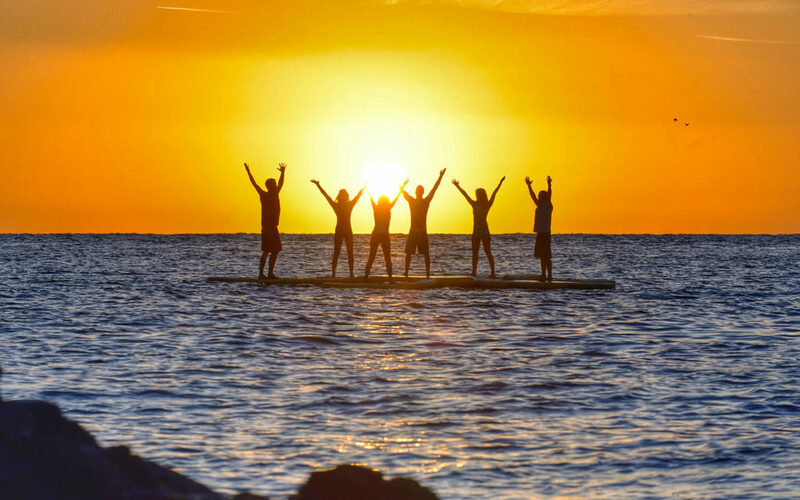 We welcome all levels, from beginners to pro, aiming to provide a unique experience of Yoga, while enjoying the natural splendor of floating in the water. From total beginners to the more adventurous Yogi. This is an awesome way to excersise outdoors & enjoy the water! Minimum 4 and maximum 8. Bathing suits that are comfortable are suitable and/or you can wear light wicking yoga gear that you would normally wear to a studio and don’t mind if it gets wet. You can leave your phone on the coast, as we will be catching the best moments with Go pro camera and share them with you after. 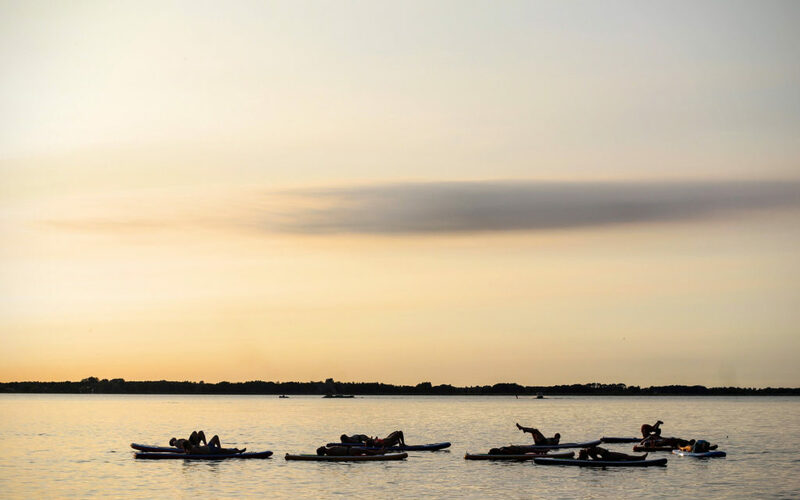 Who is SUP YOGA for? First time Yogis and Paddlers are welcome! 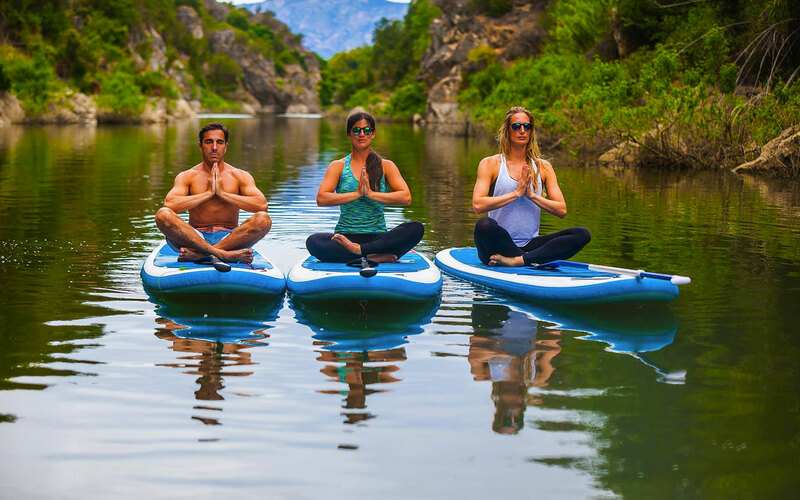 This SUP YOGA class is suitable for yoga beginners or yoga pros, there will be something for all abilities in our SUP yoga classes and yoga. Classes are avaliable Friday, Saturday & Sunday from 9:00am – 11:00am. Week day classes available upon request! If you wish to join us but timetable doesn’t suit your travel plan, please contact us for a class tailored to your needs. Stand Up Paddle board (SUP) Yoga is a fun experience. You will develop strength, balance, and flexibility. It is a unique way of connecting with nature. The yoga practice and postures are adapted to your level of confidence on the board, and to your level of experience in yoga.